Oktoberfest brings together three of the most important aspects (at least in the eyes of foreigners) of Germany: beer, dirndls and lederhosen, and wurst (and other grilled and roasted forms of meat). 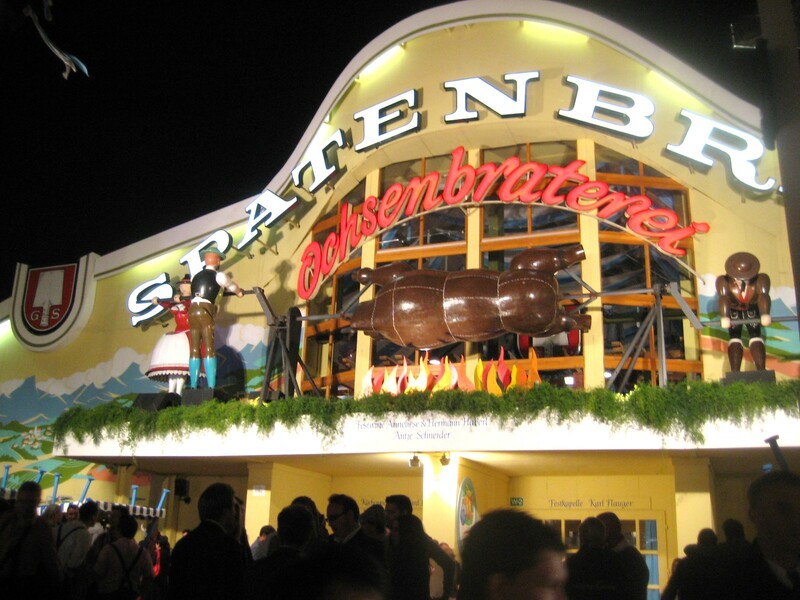 The Wiesn is one of the biggest festivals in the world, and starts 16 days before the first Sunday of October. There are all sorts of types of food – mostly carnivorous – to try: Schweinebraten or Scheinehaxe (roast pork or roast pork knuckle), a variety of würstl (I like Käsekrainer, a cheese-stuffed sausage stuffed in a bun), Kasspatzn (Käsespatzle, see Kookie’s post here), Reiberdatschi (shredded potato pancakes), and Weißwurst (white veal sausage usually only eaten before noon for breakfast, also see here). They roast whole oxen here...and then put up the name of the ox that they just roasted. I think Joanna’s favourite was Leberkäs (corned beef and pork), while mine was definitely the Brathendl (roasted chicken). 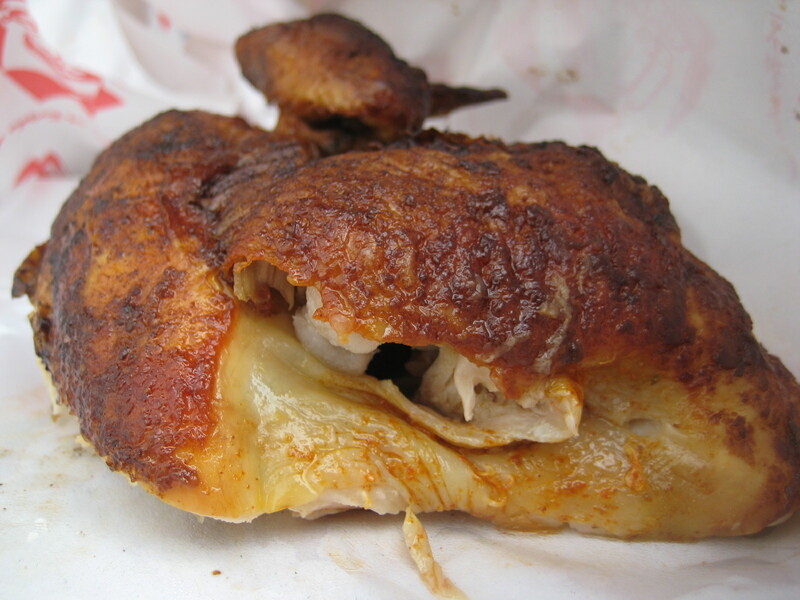 These come in half-chicken portion right off the spit, and are still crispy-skinned on the outside, fatty and juicy on the inside, and really, REALLY hot. The only real way to eat them is to just pull it apart with your hands – the stalls provide moist towelettes to clean your hands off after it’s all gone. 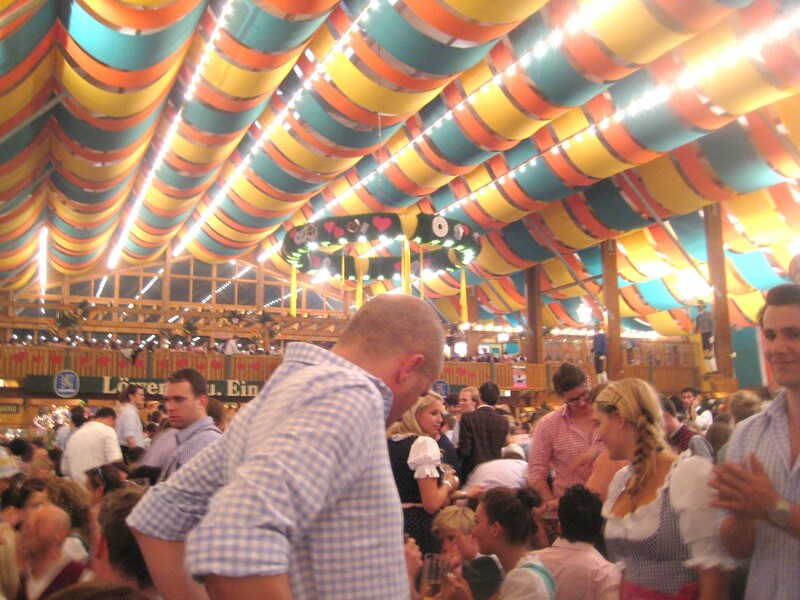 More than 700 million liters of beer are drunken each year at Oktoberfest. 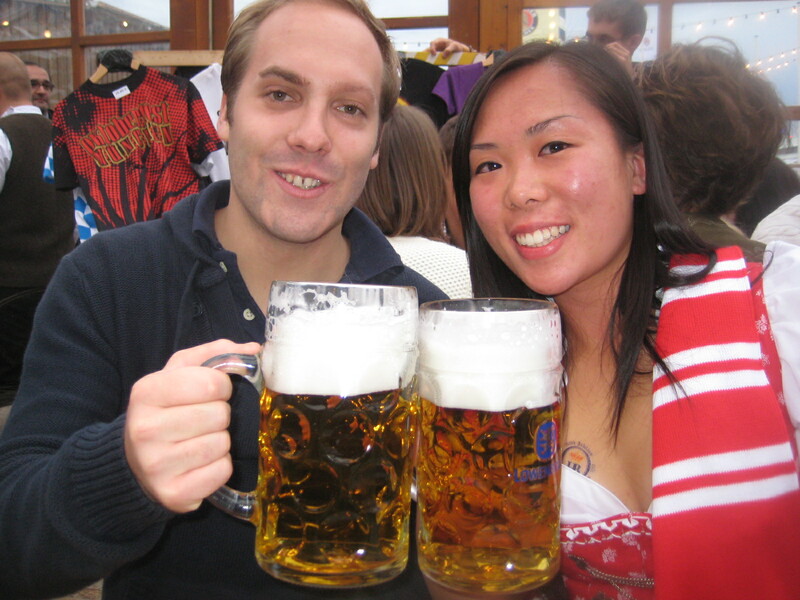 For the occasion, the Munich breweries that participate in the festival – Paulaner, Löwenbräu, Hofbräu München, Hacker-Pschorr, and local favourite Augustiner – brew a special type of beer called Märzen. This beer has a slightly higher alcohol content than most beers, a property that helped the beer keep for longer in the old days when there was no refrigeration and people weren’t allowed to brew beer in the summer (because of the risk of fire). And of course, there isn’t only meat and beer served at the Wiesn. For those that have a sweet tooth, there are also plenty of choices available. Crepes, chocolate or sugar-coated fruit kebabs, gingerbread hearts (more for decoration than eating), and roasted candied nuts can be found every few feet. Our friends also recommended that we try the Kaiserschmarrn at the Schützenzelt (literally, the Shooters Tent, one of Löwenbräu’s tents), which they said was the best Kaiserschmarrn at the festival. An Austrian dessert, Kaiserschmarrn is fried pancake bits, usually served with some kind of sauce. Ours came in a hot pan with caramelised raisins and toasted almond slivers and a dish of pflaumen sauce (plum sauce) in the middle. Excellent when it’s just hot out of the oven and it’s just starting to get a little cold outside. I can’t believe you skipped the Schweinehaxe. Greatest food day ever. There’s really nothing like eating half a chicken with your bare hands. no ma’am, there is not.